13-13-13 with added Magnesium, Sulfur, Iron and Zinc. Garden Basket is ideal for vegetables. 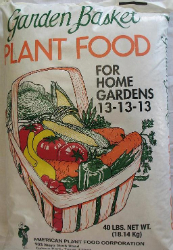 Apply Garden Basket before planting and side dress when garden is growing. Use higher rates for leafy vegetables such as lettuce, cabbage and spinach. Use lower rates for tomatoes and squash. Water garden well after fertilizing. Use Garden Basket as necessary if vegetables begin to lose dark green color before maturity.